Greenhouse Kits By SolaWrap-The 120 lb Film Snow load kit! There are various greenhouse kits on the market. 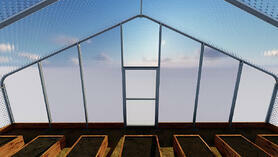 What sets this greenhouse kit apart is the SolaWrap greenhouse plastic that will cover it. Where else ill you find 10 year U.V. warranty on the greenhouse film? Learn more about SolaWrap film. Are you a NRCS program participant? Give us a ring we can help. PRICING: The price is based on your location. If you have high wind, snow, seismic or rain in your area, we will include more steel to protect against failure. While they are "kits"- they are made to order and thus the pricing varies due to your weather and location. 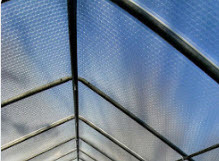 Purlins: All SolaWrap greenhouses have 5 purlins as well as collar ties and vetical bracing. WHY A SOLAWRAP GREENHOUSE KIT? * Please call 760.597.9298 for additional options. To speak directly to Ken Aguilar, Mr. SolaWrap himself please click here on your mobile phone. 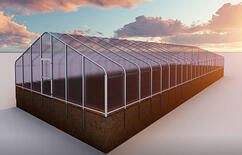 We are so excited to introduce our very own SolaWrap Greenhouse Structures. 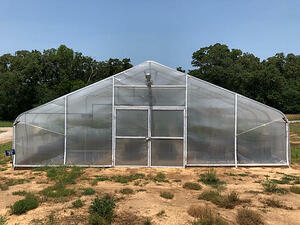 Check out the SolaWrap Greenhouses at the Noble Research Institute in Oklahoma! Who is the Noble Research Institute? They are a 400 person collection of scientists, consultants, collaborators, plant breeders, greenhouse assistants, agricultural economists, forage agronomists, beef producers, soils and crops specialists, wildlife biologists, biochemists, mycologists, genomicists, community members, teachers, life-long learners from 20+ Countries. See their SolaWrap greenhouses and watch their video. 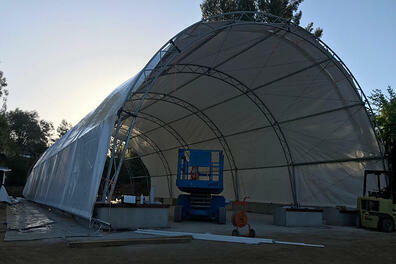 SolaWrap Custom greenhouse structures are built for the environment from where they will reside. The difference is a greenhouse built for the masses or a SolaWrap greenhouse structure that is designed and built to suit. 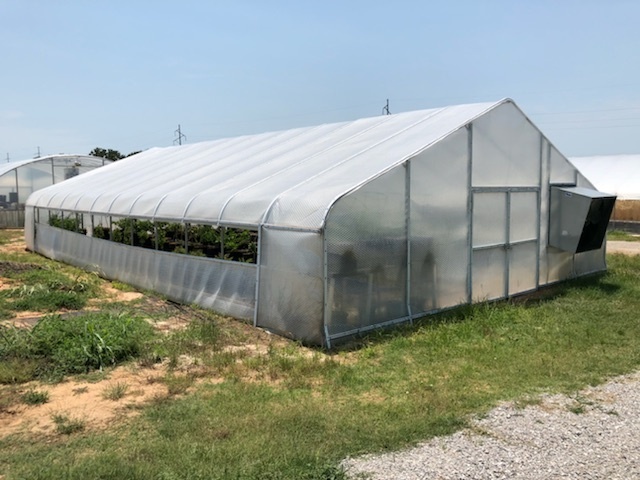 Not many greenhouse structures marry the growing requirements with the environmental stresses to maximize the final result. Today, one size does not fit all. Growing has become very technical and specialized. More than ever ROI must be mixed into the entire equation and be consistent year after year. A greenhouse failure in year five can devastate the overall results with one bad storm. This is why growers are returning to SolaWrap International with their second, third, fifth houses after seeing the result from the first house. Growers have a unique opportunity to work with a company that views the entire scope and desired outcome of a project from start to finish. The results will speak for themselves. SolaWrap Greenhouse + Fabric Building in one! At SolaWrap International headquarters, the first hybrid building is being built. It is two buildings in one! A fabric building on one end, and a SolaWrap covered greenhouse on the other end. Just share your ideas for your custom made building and let us design you a building that will suit your needs. Building a Greenhouse? Need some guidance? Do you have a quick Greenhouse structure question?